We live in a decade of Elvis anniversaries, and May 12, 2010, was another one. 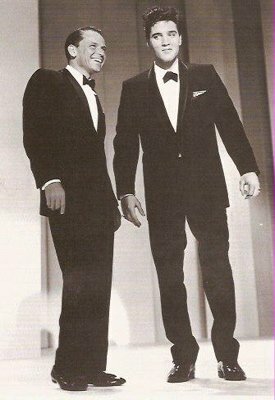 It was the 50th anniversary of Elvis’s appearance on Frank Sinatra’s TV special in 1960. The show was actually taped in the grand ballroom of the Fontainebleau Hotel in Miami on March 26, 1960. Sponsored by the Timex Company, the program aired nationally on ABC-TV from 9:30-10:30 p.m. on Thursday, May 12, 1960. 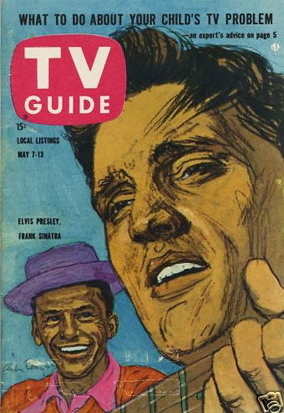 Compared to Elvis’s other TV appearances both before and after, relatively little has been written about the Sinatra show. However, at the time of its airing it had monumental significance in Presley’s career. He hadn’t appeared on TV since his final Sullivan show in January 1957, nor had he performed in front of any kind of audience since November 1957 in Hawaii. For Elvis, just released from the army, a lot was riding on the Sinatra appearance. To read the reviews at the time, you’d think Elvis’s return to the entertainment business was a colossal failure. Below are excerpts from articles in three prominent publications following the show’s May 12 airing. The first is The New York Times’s morning after review of May 13, 1960. The recent liberation from the Army of Elvis Presley may have been one of the most irritating events since the invention of itching powder. While he was in service, he lost his sideburns, drove a truck and apparently behaved in an acceptable military manner. But now he is free to perform in public again, as he did on last night’s “Frank Sinatra Show” over Channel 7. Accompanied by an orchestra and the shrieks of a group of his frenzied young admirers, he did several numbers, including a duet with Mr. Sinatra. Although Elvis became a sergeant in the Army, as a singer he has never left the awkward squad. There was nothing morally reprehensible about his performance; it was merely awful. Other participants in this taped show included Nancy Sinatra, the attractive daughter of the show’s star; Sammy Davis Jr., Joey Bishop, Peter Lawford and the Tom Hansen Dancers. In various ways, they made pleasant contributions to the show. But the crowd saved its greatest ovation for Elvis, who alas, is just beginning to obtain revenge for two years of oblivion in khaki. 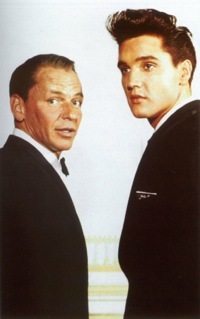 Frank Sinatra and Elvis Presley had their long-awaited TV get-together this week. The expected dynamite was, to put it politely, a bit overrated. For his reported $125,000 fee, the Memphis rocker offered two tunes, “Stuck on You” and “Fame and Fortune,” the two sides of his current disk. Beyond this, he engaged in a bit of repartee and a duet with Sinatra. In this bit, Presley sang “Witchcraft,” and Sinatra sang “Love Me Tender.” The latter came off better here as Presley had difficulty with the melody of the Sinatra hit. The harmony between the pair on “Love Me Tender” came off in good style. The impression lingers, however, that Presley has much to learn before he can work in the same league with pros like Sinatra, Joey Bishop and especially Sammy Davis Jr., who just about broke up the show with his chanting and impressions. Presley had a disturbing tendency to swing his arms back and forth, a distracting habit which gives the impression he’s never at ease. Let nobody touch his singing. That’s fine as it. What he needs is a lot of coaching on how to stand and how to talk. Another feature of the show was Sinatra’s daughter, Nancy, who displayed charm, poise, pleasant singing voice and an ability to dance. 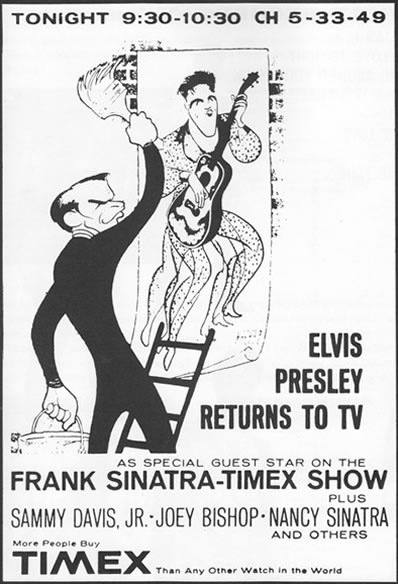 A viewer got the feeling that production values were allowed to slide because of the appeal value of Presley, but the chanter was not strong enough to make up the difference. The real winner was probably the Fontainebleau Hotel, where the show was taped last March. The hostelry got a terrific publicity break. Frank Sinatra blew the works, coin-wide, for his fourth and final special for ABC-TV this season. Parlaying top names from his own show business coterie with the first guest shot by Elvis Presley since his exit from the Army, this stanza had the kind of marquee value that guaranteed a mass audience. In that respect, the talent cost, estimated at $250,000, was no doubt worth every penny. It its runoff, however, the show didn’t generate a quarter of a millions dollar’s worth of excitement. With virtually the whole show building to Presley’s routine, the young rock’n’roller failed to deliver the climactic wallop. Working without his guitar, Presley had to overcome several hurdles. Firstly, there was a recurrent sound of screaming kids in the background. Without a single shot to document that there were, in fact, kids in the audience reacting to Presley, the hysteria could easily have been suspected of being a phone soundtrack appendix. Presley was also hurt by poor miking during his song assignments. As proved by his RCA Victor disks, he can produce a big, rocking sound with infectious beat. On this show, though, his piping registered as anemic and his hip-swivelling antics didn’t seem to have any relationship to what he was singing. Finally, Presley was saddled with a couple of juvenile-type songs. Both tunes are currently smash hits in the disk market, but that hardly means they’re the best type of material for a television program. 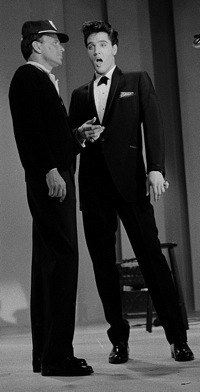 The Presley-Sinatra duet on a medley of “Love Me Tender” and “Witchcraft” also failed to jell. "For Elvis, just released from the army, a lot was riding on the Sinatra appearance. To read the reviews at the time, you’d think Elvis’s return to the entertainment business was a colossal failure."